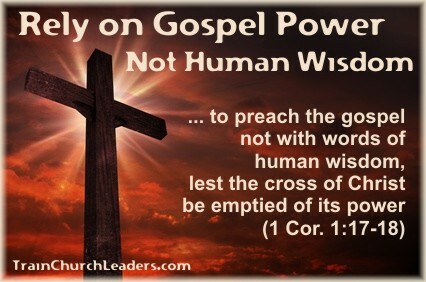 Though these verses refer to Paul’s preaching of the gospel, the principle that can be applied to any situation is that when we rest on human wisdom, we are robbing the cross of Christ of its power. 1) Human wisdom says the more numbers the better. God, however, looks for more than warm bodies to fill our churches. He desires hearts fully devoted to Him, lives changed by the power of the Gospel. When we use a standard of measurement different from God’s, we are robbing the cross of its power. — Our goals in record keeping need to line up with His! 2) Human wisdom says our records reflect what we have accomplished. God, however, brings the change and growth because of the cross of Jesus. We merely plant and water. See 1 Corinthians 3:7. When we look at ourselves as the source of what is good, we are robbing the cross of its power. — Our praise needs to go to Him! 3) Human wisdom says that an analysis of the records will determine what we can and cannot do in the future. God’s power, however, determines the possibilities. Our records are just the starting point. When we sum it all up based on what’s on a piece of paper, we empty the cross of its power. God raised Jesus from the dead! Nothing is impossible. Our future possibilities need to depend on Him! ← Previous Previous post: Turning to God or to Church Policies?